wow this is great,, I love the single colour, I also love the previous painting from your lesson. Great scene very Morandi like, good idea to put some salt on the background, gives a good contrast. 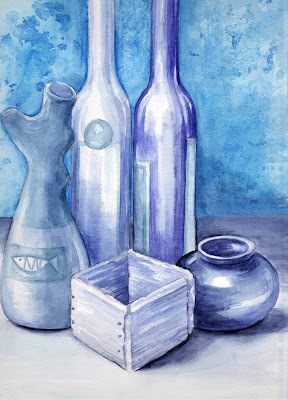 I have titled a painting "Feeling blue" last year. Not surprisingly it had a lot of blue in it and I didn't like how it came out :(, so the name worked. I do like yours very much! The forms have a nice turn to them. Beautiful! Wish I were your student! This is gorgeous! I love your blues and purples. Your use of tone and shade is superb!